Ayush Tripathi is based at OriginClear headquarters in the Los Angeles Cleantech Campus and its Advanced Prototyping Center facility. Ayush is responsible for testing and research activities to develop OriginClear’s Electro Water Separation™ with Advanced Oxidation (AOx™) and to continuously enhance its next-generation features. He also works with licensees and OriginClear’s Asia team to scale up the technology and to implement successful field applications. Ayush has extensive industrial exposure through internships and trainings. Ayush’s passion lies in solving the global water crisis. He has a strong research background with research publications in national as well as international journals, which makes him adept at using the latest equipment and implementing modern technologies for solving problems. 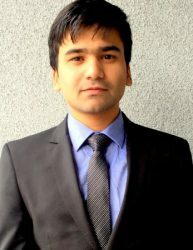 Mr. Tripathi has a Bachelor’s of Technology degree in Chemical Engineering from the National Institute of Technology Raipur, India, and a Master’s of Science in Chemical Engineering from the University of Southern California (USC).